John P. Makenzi: BEd. (Sc) UON, Chairman/CEO and founder of MEC. Mr. Makenzi started his career as a teacher at Alliance High School and went on to teach at Precious Blood S.S Kilungu and Tala High School, Tala, where he was promoted to Principal. 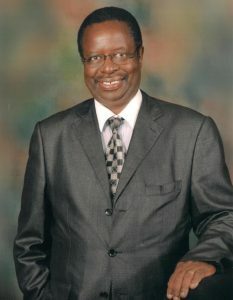 He has led several other schools as Principal such as Kapsabet Boys High School Nandi, Moi Forces Academy Nairobi, Kagumo Teachers College and then as Chief Principal at Lenana School and Machakos School where he took on early retirement. He then went on to work in the private sector at Aga Khan School. For a long time he had felt driven to start his own establishment where he could truly realise and execute his knowledge and experience acquired in his 40 year career and that led to the birth of Mackenzie Education Centre in 2003. Due to his indisputable experience in the education industry, he continues to server as chairman of B.O.G committees in various schools in the country and is constantly invited to speak to students and parents alike. He continues to work tirelessly in partnership with the students, teachers and non-teaching staff to build Mackenzie Education Centre into the institution that it is today and continues to be a constant source of wisdom and inspiration to all parties as they collaborate to build a community of disciplined, emotionally mature, well-rounded individuals. He believes that experience can be a dangerous tool particularly if it involves accumulation of mistakes for many years but if experience is charged with positive ideals, personal dynamism and emotional maturity then it can be of great benefit to the students that pass through MEC. Mrs. Janet Mueni Makenzi: Dip. Ed. (KSTC), BEd. (Sc) Acadia University, Canada, Co-Founder MEC. Mrs Janet Makenzi started her career as a teacher at Kahuhia Girls and went on to teach at several other schools such as Precious Blood Sec. School, Kapsabet Boys, Kangundo High School and finally at Tala High School. While at Tala High School she decided to take early retirement. She had always been of entrepreneurial nature and decided to venture into the book selling business which led to creation of Books and Books Enterprises which is a business partner of MEC. She has excelled at several ventures such as poultry farming, Forever Living Products and this has exposed her to various markets in East Africa and South Africa. She currently serves as the Finance Director at MEC.